Chocolate Sourdough Bread for sale. Buy online at Zingerman's Mail Order. Gourmet Gifts. Food Gifts. For schoolchildren anywhere—and any age. I have always been a fan of our Better than San Francisco Sourdough Bread, but for a while I was hesitant to try our Chocolate Sourdough. I had a Goldilocks dilemma—would it be too sweet, would it be too sour, or would it be juuuust right? When I finally tried it, I immediately regretted all of the time I spent worrying about the flavor. Everything I love about our Sourdough Bread—the chewy crust, the present but not overpowering sour tang—marries beautifully with the rich, smooth Belgian chocolate chunks that are present in almost every bite. Some may recommend that you use it to make supremely decadent french toast. Others may suggest that you serve it with our hand-ladled, Fresh Cream Cheese. These ideas are excellent, but sometimes the simplest methods are the best methods. If you're patient enough to wait fifteen minutes to warm it up in the oven, you'll be rewarded with the sweet aroma of warm chocolate spreading through your kitchen. If you're unable to wait, then I can tell you that it will be perfect right out of the bag! "Seriously, the best I’ve ever had. I found myself having four pieces of toast today for breakfast. Made the first two and then went back and cut two more slices. I’ll be placing mail orders soon! The Bay Area should be ordering their sourdough from you, and I’m sure some already do." 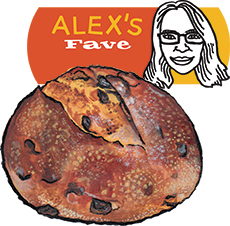 "One of my favorite indulgences is Zingerman's Chocolate Sourdough Bread. Though it sounds unusual, chunks of bittersweet chocolate and the piquant tang of sourdough are a brave and satisfying combination."